The Orbiter Mini UAV is designed by Aeronoautics Defense Systems for military and homeland security operations. (CNN) -- Federal authorities were investigating Friday the circumstances of a drone that crashed in El Paso, Texas, this week, which U.S. officials said originated in Mexico. Mexican Attorney General spokeswoman Rocio Torres denied her country's involvement with the drone Friday, but later in the day, another Mexican official said the drone was being operated by the Ministry of Public Security and was following a target at the time of the mechanical malfunction. The Mexican official did not know the nature of the surveillance but said "we know they were following a target." He did not know how the malfunction affected that operation, if at all. Ricardo Alday, a spokesman for the Mexican Embassy in the United States, also said the drone belonged to Mexico and was part of an operation in coordination with the U.S. government. "It was flying on the Mexican side of the border when it had a mechanical malfunction," Alday said. "It is my understanding both Mexican and U.S. authorities were fully cognizant of what was going on in the area." Alday said the drone malfunctioned, entered U.S. airspace and landed in El Paso. U.S. Customs and Border Protection Special Operations Supervisor Ramiro Cordero said a resident called his agency Tuesday evening "about something in front of his property." The agency picked up the device and consulted with officials in the Department of Homeland Security and the U.S. Consulate in Juarez, Mexico. "We determined it was the property of the Mexican government," Cordero said. U.S. National Transportation Safety Board spokesman Keith Holloway said he believed that the drone "was owned by the government of Mexico, and I think they were the operators." "We are collecting data," Holloway said. "We are not sending anyone down to the scene. We are collecting information to see what occurred." A U.S. government official said authorities are "100 percent" sure that the drone belonged to the Mexican government, which used it for law enforcement and homeland security. Operators lost control of the drone, and it crashed, the official said. Another U.S. official said the drone flew out of control. He described it as small, with a 6-foot wingspan. "They are little. They are squirrelly. A gust of wind can wreak havoc on these things," the second official said. A parachute deployed before it hit the ground, and the drone was found intact, with no one hurt and no property damage, the official said. "There is nothing to suggest that there was any kind of surveillance activity that was going on with anything used by the government of Mexico in U.S. airspace," the official said. "There is nothing to support that they were spying on us," the official added. "There is nothing to cause alarm or suspicion." A spokesman for NORAD, which is responsible for the aerial defense of the United States, said that it had real-time awareness of the situation but that it was not deemed to be a threat and did not require any NORAD response. NORAD said the Federal Aviation Administration and its Mexican counterpart are responsible for the civil airspace over their respective countries and coordinate cross-border air traffic. Officials with the Mexican military, which also uses drones, didn't respond immediately to calls for comment. 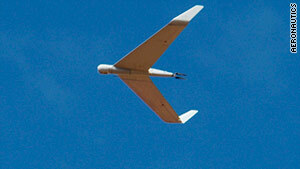 The crash of an unmanned aerial vehicle from Mexico would be a first on U.S. soil, Cordero said. He said U.S. Homeland Security has turned the drone over to the Mexican Federal Secretariat of Public Safety in Juarez. Holloway said the craft was an Orbiter Mini UAV designed by Aeronautics Defense Systems, whose website describes it as "a compact and lightweight system designed for use in military and homeland security operations" and "the ultimate solution for over-the-hill reconnaissance missions, low-intensity conflicts and urban warfare operations." Unmanned drones are routinely used by the U.S. Department of Homeland Security to look for illegal immigration on the U.S.-Mexico border. CNN's Michael Martinez, Nick Valencia and Dave Alsup contributed to this report.